This is one of the most persuasive and idiomatic Roussel discs in the CD catalogue and I enthusiastically commend it to you.’ Words I used in a review that coupled the Second Symphony with the Suite in F and Pour une fête de printemps. It now forms part of a boxed set with other well reviewed issues in this complete symphony cycle. He was one of the many artists whose was emotionally and profoundly effected by the First World War, his output after that period taking on an acidic mood that did not find a ready market. Yet it was the third period, when his music took on a hard-hitting style with driving rhythms, that his music eventually found critical acclaim. His symphonies were spread across those periods and are very different in mood and texture, only the Third having entered French music’s standard repertoire. It has been a major undertaking for the French conductor, Stéphane Denève, an intuitive Roussel interpreter, who adds to the symphonies many more of the composer’s works including two extensive suites from the ballet, Bacchus et Ariane; the Sinfonietta and the emotionally charged Resurrection. 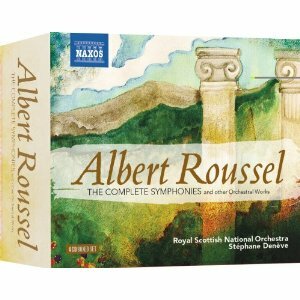 Together they form an ideal compendium to the composer’s orchestral works, the playing of the Royal Scottish National is a match for the best French orchestras and the sound engineering is first class. The discs are offered in a slipcase at the price of three normal releases. Naxos has thoughtfully boxed up Stéphane Denève’s complete Roussel symphony cycle, thus providing an excellent excuse (once again) to give it the strongest possible recommendation and to urge you to snap it up without delay. There have been excellent individual performances of these works over the years—Munch in Nos. 3 and 4; Martinon and Eschenbach in No. 2; Bernstein in No. 3—as well as a few decent if not thrilling cycles, but none so consistently fine overall as this. Similarly, the complete Bacchus et Ariane is well served (by Tortelier on Chandos), and so is the second suite, but Denève’s interpretation ranks right up there with the best. His Scottish orchestra plays with all of the necessary gusto and rhythmic fire, and the sonics leave little or nothing to be desired. Here’s one collection with no weak links at all—you can buy all four discs together with total confidence.